Paddle a canoe through the Okefenokee Swamp keeping an eye out for the resident alligators. Tour the Georgia State Capitol on Washington Street, Capitol Square, Atlanta. It also houses the Georgia Hall of Fame and the Hall of Flags. Located in downtown Atlanta across from Centennial Olympic Park, the brand new Georgia Aquarium is the largest indoor aquarium in the world. It boasts an impressive 8 million gallons and 505,000 sq ft, and features more than 100,000 freshwater and saltwater fish and mammals representing 500 species from around the globe, divided into 60 different habitats. The largest one holds over 6 million gallons of water and was specially designed to house whale sharks alongside tens of thousands of other coral reef and open ocean creatures. Another striking feature of the aquarium is its 30m (100ft) long tunnel, one of the largest aquarium windows in the world with views into whale shark habitat. The second largest habitat (800,000 gallons) was specially designed to simulate the natural habitat of beluga whales. Pan for gold in Dahlonega (www.dahlonega.org), an old mining town. Visit Madison, an historic town spared from ruin during Sherman's 'March to the Sea' in 1864. Spend the day at Tybee Island (www.tybeeisland.com) featuring sands, fishing piers and a marine science centre. The city is also home to the celebrated Savannah Jazz Festival in September. Explore Jekyll Island's (www.jekyllisland.com) unspoiled natural beauty and fascinating history. It's an ideal destination for bird watchers, golfers and history enthusiasts, and was once the winter sanctuary of some of the US's wealthiest industrialists, such as William Rockefeller and Richard Crane. Play a game of golf on one of over 400 golf courses in the state. Georgia is a paradise for outdoor enthusiasts due to its temperate climate. Travel to the Pine Mountain area (www.pinemountain.org), noted for its Callaway Gardens and for President Franklin D Roosevelt's Little White House (www.fdr-littlewhitehouse.org) at Warm Springs. Shop in Underground Atlanta (www.underground-atlanta.com), a restored four-square block shopping and entertainment area, located near the business centre of Atlanta and home to the Zero Mile Post, which marks the city's birthplace. Climb or ride the cable car to the top of Stone Mountain (www.stonemountainpark.com), where gigantic representations of three confederate heroes (President Jefferson Davis and Generals Robert E Lee and Thomas 'Stonewall' Jackson) have been carved into a cliff-face. Pay your respects to an icon at the Tomb of Martin Luther King (www.nps.gov/malu), located at the Ebenezer Baptist Church in Atlanta. Raft the rapids on the Ocoee (site of 1996 Olympic events) or Chattahoochee Rivers. See the wildlife at the Atlanta Zoo (www.zooatlanta.org) in Grant Park. 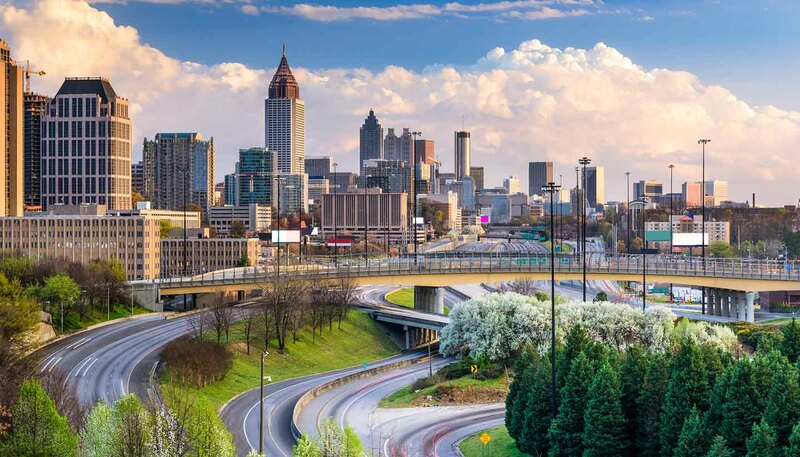 While at the park, tour the restored Confederate Fort Walker, and the Cyclorama, a world-famous 123m- (406ft-) circumference painting of the Battle of Atlanta. View over 100,000 fish and sea creatures at Atlanta's Georgia Aquarium (www.georgiaaquarium.org), billed as the largest aquarium in the world.